Welcome to the Department of Economics and Business Management, UVAS Business School. With focus on continued professional development and high-quality education, our department aims to enhance your career prospects. We offer a range of degree programs to cater the educational needs of different segments of the country. MBA with specialization tracks in Life Sciences is one of the unique programs of this country. It offers a unique combination of traditional tracks and industry driven specialization routes. Offering MBA Executive in evening provides excellent opportunity to working class to boost their skills and careers. The BBA program is one of its kind, which fosters active learning approaches, instills innovation, and explores the bounds of latest business challenges. We also offer the Masters of Banking and Finance (MBF) program to cater the 14 years graduates and provide them an opportunity to develop their professional capabilities and progress in the field of banking and finance. 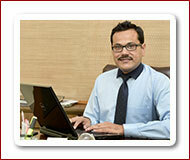 With utmost pleasure, we also offer M.Phil (Business Management) to accommodate the research oriented needs of students. The program aims to enhance the research potential of graduates and allow them to be a change catalyst in the industry as well as in the world of academia. To enhance research potential in the domain of livestock, we have joined hands with various funding agencies like USAID-PEEP to establish a Centre for Applied Policy Research in Livestock (CAPRIL) and Export Facilitation Centre for Livestock and Poultry (EFCLP) at this business school. It is helpful in creation of research opportunities for post graduate students. We emphasize inviting business professionals from real world to impart their practical knowledge and share personal experiences with students to create a link between theory and practice. The students are also encouraged to participate in workshops, seminars, and training sessions to get hands-on experience. UVAS Business School is growing steadily through extensions in its infrastructure and learning facilities. It is also in the process of getting accreditation by National Business Education Accreditation Council (NBEAC) of HEC. The quality of business education can be judged from the fact that it has the legacy of competing and winning various educational competitions at national level like business plan competitions with other business schools of Pakistan. Full employability of its graduates in field is another indicator. Based on these facts, the student body and programs are growing steadily. In addition to academic progress, DEBM also focuses on personal grooming and development of its students. I am immensely proud to be leading this growing professional place and envision making it one of the best business schools in Pakistan. On behalf of my team, I invite you to become part of UVAS Business School. "The University aspires to be the nation’s leading Public Sector University with global recognition based on its quality, teaching, research, civic engagement and economic development"